The Lynchburg, VA News and Advance photo. Moms Demand Action remain desperate for relevance in today's political landscape. Their latest ham-handed effort to garner publicity for their misguided cause? Handing out 200 sample-sized containers of laundry detergent at a Lynchburg, VA public housing complex. 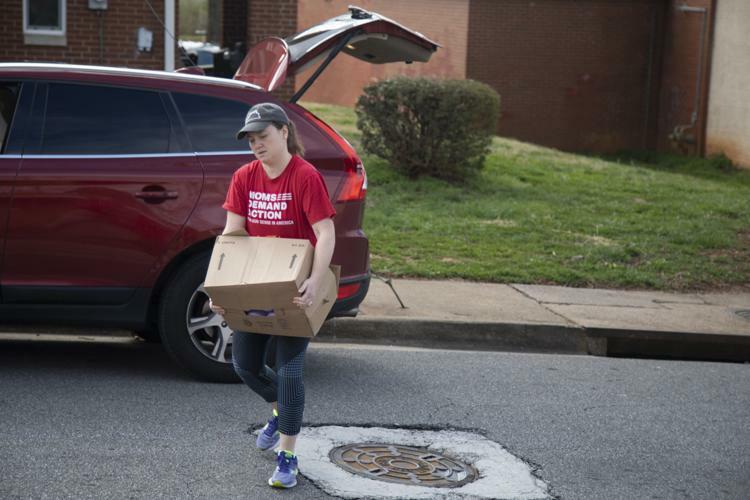 The Lynchburg chapter of Moms Demand Action, a national organization advocating for stricter gun laws, distributed about 200 bottles of laundry detergent Tuesday to the Dearington apartment complex — a publicly owned housing complex for low-income residents. Brenda Moss, the community outreach lead for the chapter, said the detergent was entirely funded by donations. The giveaway, she said, was made to help spread the chapter’s message and to provide residents with a crucial household item many take for granted. They care? Can you spell 'virtue signaling'? Because a box of el-cheapo laundry detergent shows you care how exactly? You know, the one thing gun owners have (that the other side doesn't) is the ability to bring people over to the gun rights side of the equation in the span of a morning or afternoon. Taking a non-shooter to the range and letting them experience the thrill of the first time shooting a gun and the empowerment it provides will usually forever change them and their views on guns. Kids and adults alike. Just look to the top of this page on the right side… that television reporter had never fired a gun before and she had a great time firing her first shots. There is no equivalent for Moms Demand Action or any of the other gun grabbing groups. All they can play upon is the fears and emotions of people who don't know better. And now, hand out crappy laundry detergent. No amount of laundry soap will make people hate guns. Nor will it likely sway people into more readily surrendering their rights. This entry was posted on March 28, 2019 at 1:43 pm and is filed under Blog. You can follow any responses to this entry through the RSS 2.0 feed. I guess they've gotten tired for a bit with the same old lying, misstating, misrepresenting and conflation schtick…just like they tired of truth, justice and the American system.
" They care? Can you spell 'virtue signaling'? Because a box of el-cheapo laundry detergent shows you care how exactly? " Don't you mean the moms are showing what they feel? Those people are dirty and in need of being taken care of? Hence the mom's give them soap. It should be " soft soap . Lets hope they can get some laundry soap to Jusse "Smells-a-lot" Smollett. Maybe he would "clean up his act" and the HOAX he perpetrated on Chitcago police detectives and the nation. Jussie Smells-a-lot still believes he is INNOCENT of all wrongdoing, it must be written in the SCRIPT he read to the detectives and the sNews mediaidiots.